Are you planning a well-deserved beach holiday? Then the Costa Brava is an obvious option. It has a beautiful coast with various different beaches, that will really surprise you. Along this rugged, wild coast there are many breath-taking beaches to discover. The Costa Brava really has something appealing for everyone! 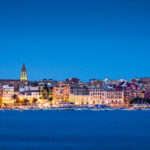 You can easily switch from wide ‘tourist’ beaches to quiet narrow bays, or to those charming picturesque beaches that are part of lovely authentic fishing villages. 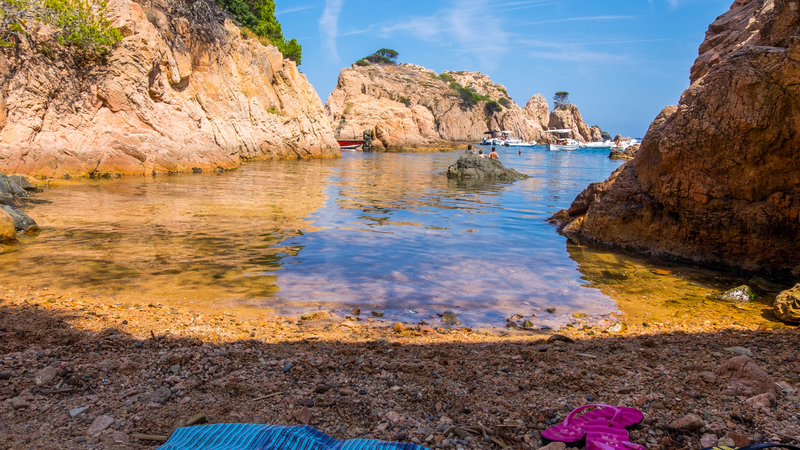 Furthermore, in the Costa Brava you can naturally also enjoy the perfect beach weather, thanks to the wonderfully mild Mediterranean climate. 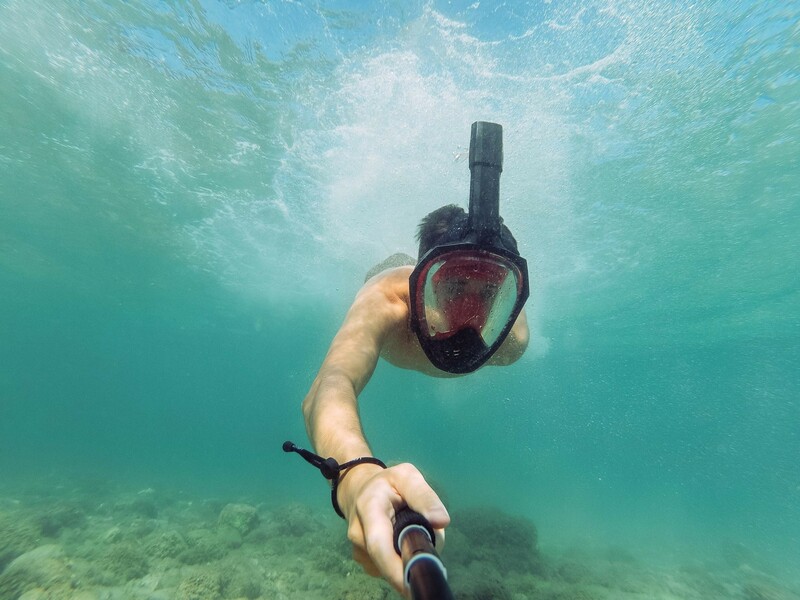 And if you are looking for some adventure on the beach, there are plenty of beach activities in this coastal region that will give you that adrenaline rush. And after a great all-encompassing day at the beach where everything is possible, you can go home to your own luxury holiday villa, tired and satisfied. Doesn’t this sound like the perfect holiday? So what are you waiting for… Vamos a la playa, let’s go to the beach! 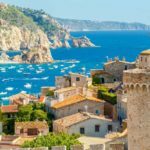 You can now plan your perfect dream holiday with this Costa Brava beach guide, packed with useful information for the ultimate beach holiday. 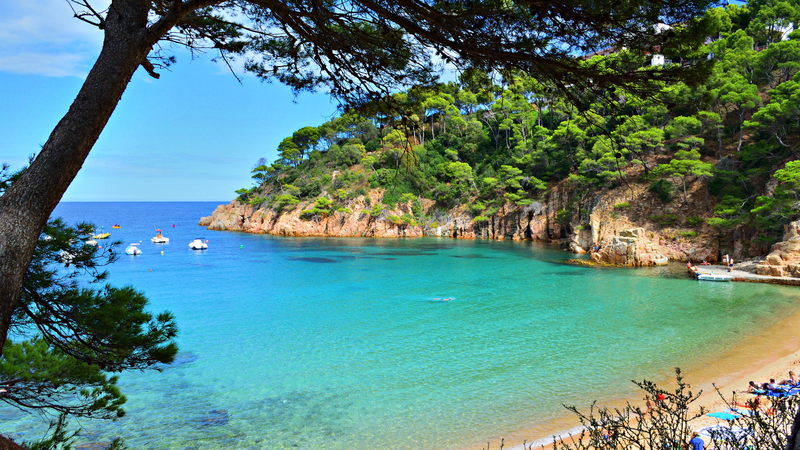 The Costa Brava really is one of those holiday destinations that will continue to surprise you, likewise its beaches. This beautiful region, with a coastline of up to 158 kilometres, is of course known for its breath-taking beaches! However, what is perhaps less known, is the diversity of this beautiful coastal area. 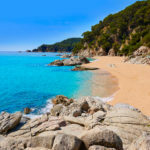 Naturally, you will find the more famous tourist beaches here, such as the beaches of the popular destinations Lloret de Mar, Tossa de Mar or Platja d’Aro. Thanks to the perfect central location of these beaches you can enjoy almost all imaginable and desired amenities: small bars, little restaurants, beach loungers, parasols, toilets, play areas, parking places, showers, sports facilities, water sports activities and much more. Therefore, these beaches are often ideal for families, because they are easy to reach and have many amenities to enjoy. The Blue Flag beaches are of course also suitable for families as this is a guarantee of the quality of the beach and its amenities. But maybe you prefer quiet, secluded beaches? 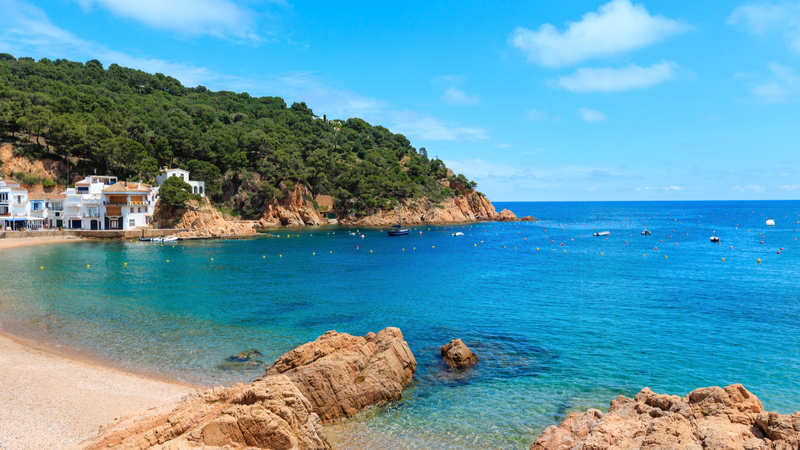 No worries, you can still have a great time in the Costa Brava. Around the corner of almost every large beach you will often find a smaller bay or cliff with quiet beaches and a lot more nature. In general, the sand is better and the water is clearer, which makes it much better to go snorkelling here. However, you must keep in mind that you will normally find less amenities here but there are often one or two small restaurants. Is this still too busy for you? Then discover one of the “secret”, almost untouched beaches of the Costa Brava that are hidden in nature between the cliffs and the bays. It might be a bit more difficult to get here but the almost heavenly beaches will be worth it. As I said above, you will find a small beautiful beach around the corner of every large beach. This also applies to Platja de Treumal which is only a five-minute drive from the centre of Blanes. The special location in a botanical garden allows you to imagine yourself in a different world. The Treumal beach is situated on Pinya de Rosa, a protected area where you will find a botanical garden full of cacti. During winter, autumn and spring this beach is almost deserted but in the summer you can rent beach loungers on this 400 metre long beach and you will also meet other holidaymakers here. 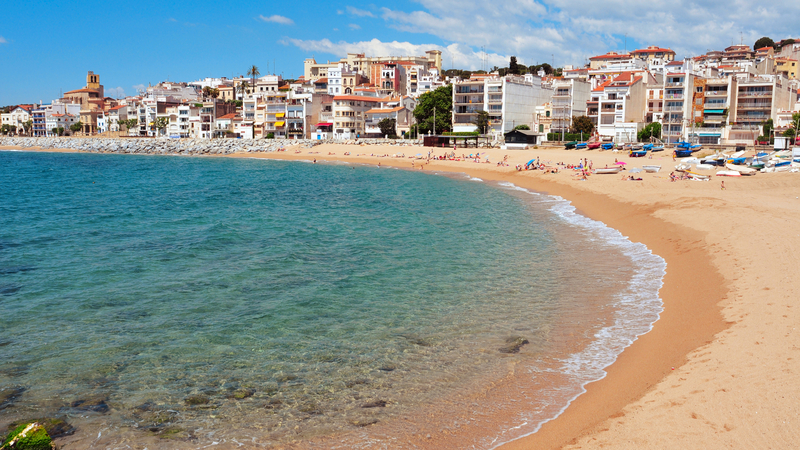 This beach is located near Blanes so you can combine the beach, nature and the city. What makes it so nice is that there are various amenities and parking facilities in the area. Platja de Castell is blessed with clear water which makes it a perfect place to dive and snorkel. It enjoys a special location against the headland, bordering the ruins of the sixth-century Iberian settlement of Punta de la Corbetera. 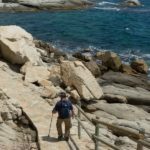 The beach is near the town of Palafrugell and you can get there by car but also by following the coastal path at La Fosca beach. The locals are very fond of the beach and that is the main reason that this beach still has a natural and quiet charm. For example they invest all the parking fees in the preservation of the area. During the summer there are toilets, a newspaper kiosk and kayaks for rent, but this beach is also lovely in winter or autumn because it is fully sheltered from the wind. This beach is located south of the coastal town of Tossa del Mar and from the warm sand you look out on this town and its Medieval wall. Despite its proximity to the town, Es Codolar has retained its natural beauty and charm. On the one hand you will find stunning cliffs and authentic fishing boats but on the other hand there are also nice bars and restaurants within walking distance. 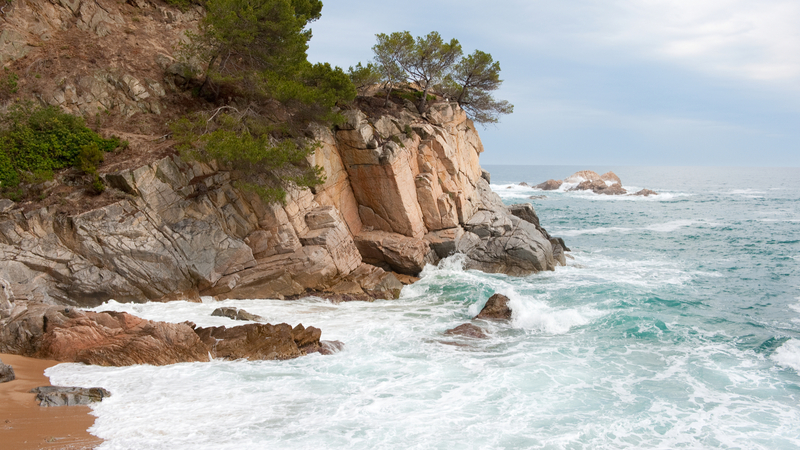 Would you like to discover the rugged Costa Brava? Then Cala Senyor Ramón is really the place to be. The beach is situated in a small bay against a mountain, has clear blue water and a special remote location. The beautiful beach of no less than 800 metres is surrounded by lots of nature, a large section of open sea and two rocky mounts. You can enjoy extra privacy on this beach. But the nice thing about Cala Senyor Ramón is that, despite the peace and quiet, this beach is still easily accessible by road, the footpath from Rosamar or the sea. Cala Senyor Ramón is located between Tossa de Mar and Sant Feliu de Guíxols in the picturesque village of Santa Cristina d’Aro. Are you looking for a secluded beach with lots of privacy? Then check out Aigua Xelida. You can reach this beautiful small bay by foot, via nearby Tamariu, and once you have arrived you will find yourself in total isolation in a natural paradise. It takes a little more effort to reach this beach but this effort is definitely worth your while. 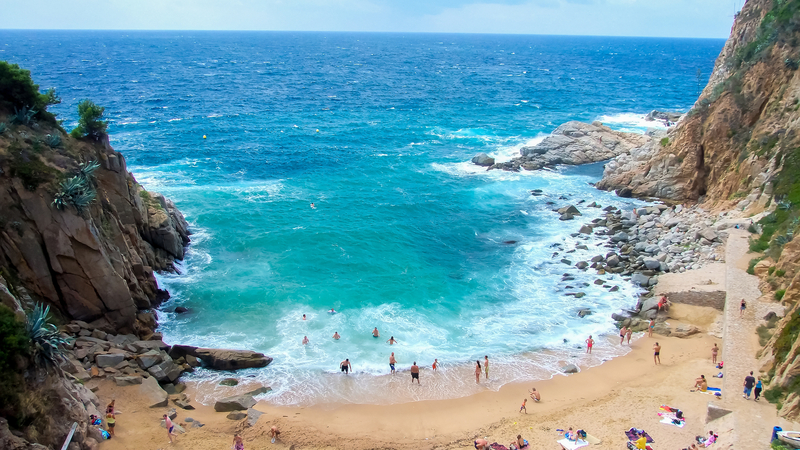 In Catalan, aiguablava means blue water, and that is what this beach is known for. The sea water has a wonderful crystal-blue colour that provides a lovely contrast with the fine, white sand and the green of the pine trees. Aiguablava is a heavenly beach with a breath-taking beauty. So, it is no surprise that Aiguablava is known as one of the best beaches in the region, partly thanks to its stunning nature. 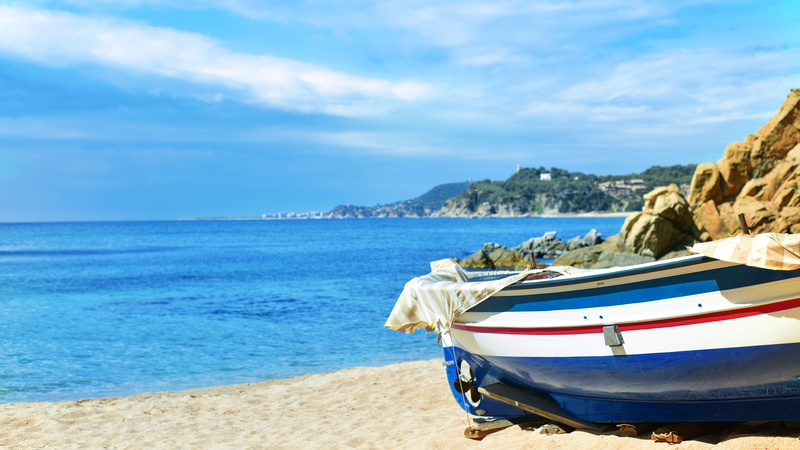 You can find this lovely beach in the town of Begur and it is definitely worth a visit. Do you like authentic fishing villages with nearby beaches? Then Port-Bo, in the town of Calella de Palafrugell, is the perfect place for you. 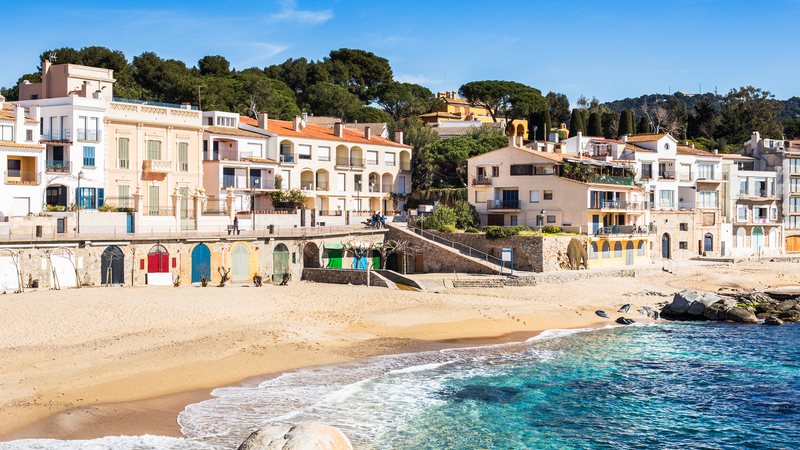 After all, this is one of the most charming fishing villages of the Costa Brava with a characteristic beach. The small beach is surrounded by rustic fishermen’s houses and typical old-style boats. During summer the beach becomes a bit livelier but you can still find yourself a nice spot there. Would you prefer a more popular beach with plenty of amenities? 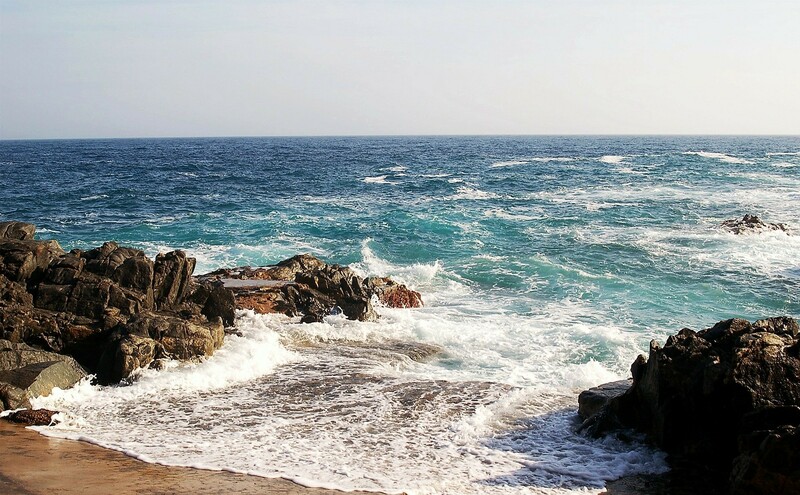 Then Platja de Canadell, which is also part of the coastal town of Calella de Palafrugell, is an excellent choice for you. It is crowded during summer but it is worth it nevertheless: it is a charming old fishing town that has been converted into a true beach town for wealthier Catalans. As a result, the beach also has many amenities, the beach for example is surrounded by many bars and restaurants. But pay attention to the price as this is one of the more expensive areas in the Costa Brava. If you are looking for a beach with a lot of natural beauty and splendour, you must really visit Cala Montjoi. 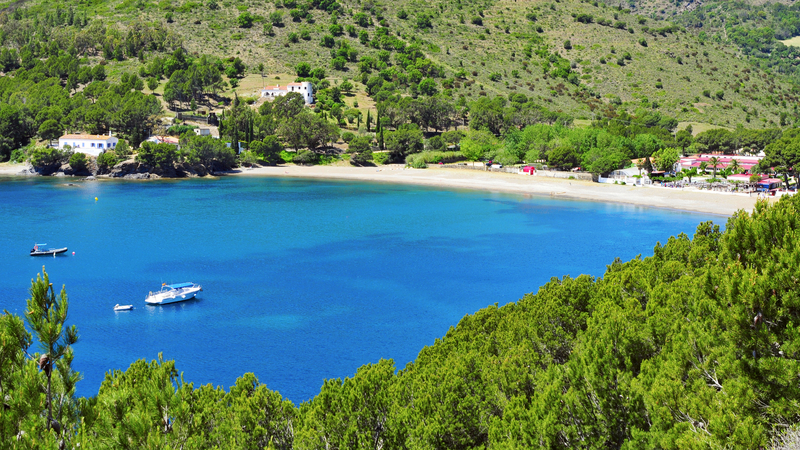 This beach is located in the Cap de Creus nature resort. This is a lovely sanctuary with impressive nature and the same applies to the beach. The beach is located in an area that is hardly touched by tourism and the human hand. This makes Cala Montjoi a really special beach and probably one of the best beaches in Spain. But this is not intended for the lazy beachgoer as it is quite a hike to get to the beach. This beach has the best of both worlds: the great amenities of a city beach and the unspoilt environment of a nature beach. Tamariu beach has crystal-clear water and white sand, but also plenty of amenities, including showers, restaurants, a diving club, a sailing club, kayak rental and much more. Along the pedestrian promenade, directly behind the beach, you can find delicious seafood restaurants, cosy cafes and trendy bars. The beach is about 180 metres long and 40 metres wide and is surrounded by trees. This small, horseshoe-shaped bay at Calella is perfect for sailing and snorkelling and is ideal for families with children. This is also a quieter beach that is located around the corner from a larger beach. Cala Rovira is situated just outside Platja d’Aro and is therefore the ideal choice if you want to escape the crowds of city beaches. You can reach the beach via the Camí de Ronda coastal path. Once you have arrived you will be totally surprised by the stunning white, green and blue colour combination. Do not expect the beach to be deserted, you will always meet some beachgoers here. Sant Pol is located in a beautiful bay on the edge of Sant Feliu de Guïxols. As the beach is on the edge of this town, it is not so much a nature beach but more a comfortable city beach. And the beauty and charm of this beach is also perfectly reflected in the surrounding buildings with their special architecture from the previous century. Would you like to see some nature too? Then walk towards the south of the beach where you will find rugged rocks and coves. 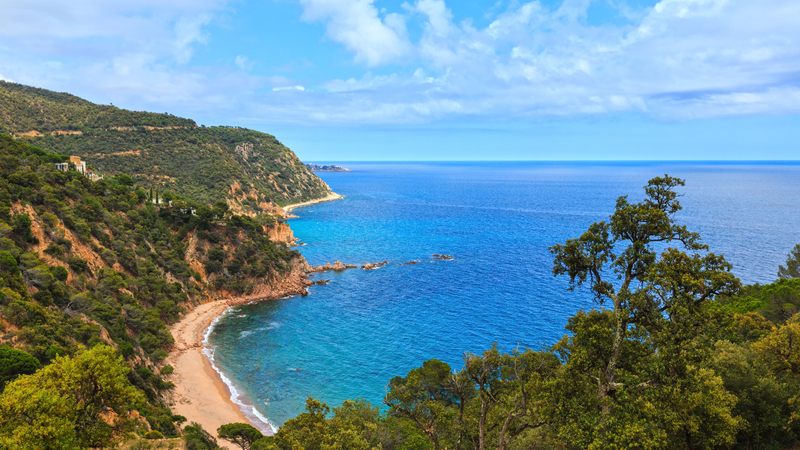 The Costa Brava also has a pleasant Mediterranean climate with mild weather and fine temperatures. Thanks to the north-eastern location the weather in this region is normally slightly cooler and wetter than in other Spanish coastal areas. This means colder winters but as a result you can also enjoy more pleasant temperatures in summer, as it will not be so hot. During the warm Spanish summer this warm but slightly cooler and damper weather can feel very pleasant indeed. 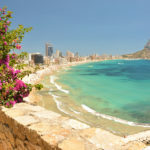 The summer period has an average temperature of about 25 degrees, which means it is pleasantly warm without getting too hot, as is the case in the more southern Spanish regions. So here you can enjoy the perfect beach weather: sunbathing without being overwhelmed by the heat. You can also go for a dip in the sea, which has an average temperature of 19 degrees. Spring and autumn are also sunny and wonderfully mild, these seasons still have warm and very pleasant temperatures so you can still enjoy the beach. The advantage is that you are not bothered by the many tourists that visit this region in the summer. During a beautiful day in spring or autumn, the weather is nice enough to lie on the beach in swimwear, to get a tan and even go for a swim in the sea. The weather in winter varies: from mild to cold, but often not as cold as what we are used to in the UK. So, there are plenty of things to do for an active and challenging beach holiday! 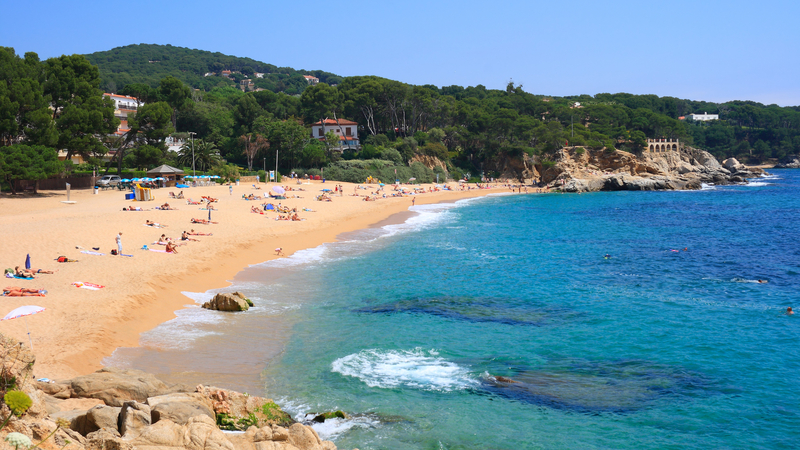 The beaches on the Costa Brava are diverse, therefore you will not get bored easily during a holiday packed with visits to many special beaches in this coastal area. Each beach has its own charm and is therefore really unique in its own way. 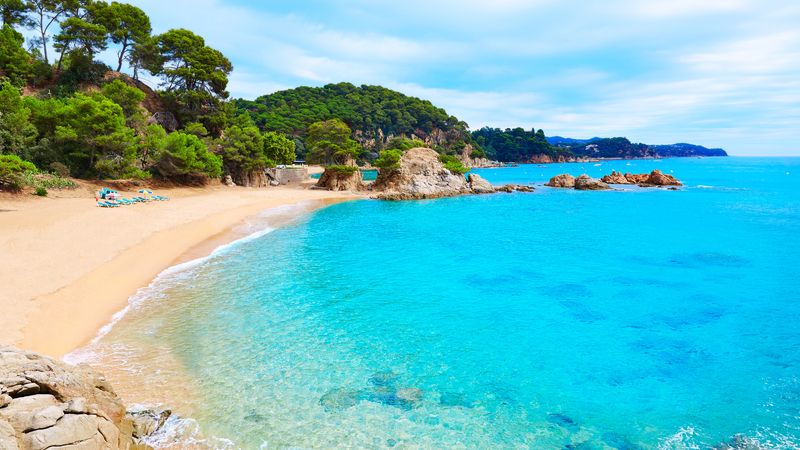 The Costa Brava is such a nice place because it is a relatively small area so you have the opportunity to discover many beaches during your holiday. You can easily stay in one place and travel to the various beaches from there, by car, public transport, bike or even by foot. Do you not want to spend all your time at the beach? Or do your fellow travellers not fancy a pure beach holiday? 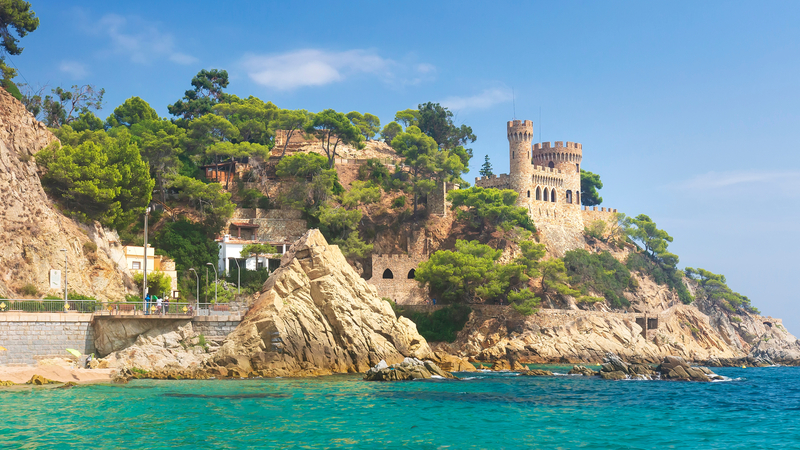 The Costa Brava also has plenty of other things for you to discover: wonderful nature, a variety of sports, lively cities, authentic villages, delicious food and bustling festivals. So, there is always something to do for everyone: everyone’s happy and you’re happy too. And why not complete this picture of a beach holiday by renting a beautiful beach villa, located on one of the great beaches of the Costa Brava, with a lovely view of the sea and with plenty of space and peace to relax after a day at the beach. This way you always have your holiday home nearby for a tasty lunch or to seek shelter from the sun during the hot afternoons. And with a holiday home in a central location on the Costa Brava you can also easily visit other beaches, enjoy nature or experience some of the culture. And be honest… where can you experience more quality time with your family than in your own holiday villa with private swimming pool and near the beach! But there are many more benefits you can enjoy when you choose to stay in a holiday villa during your beach holiday. One of the main benefits of renting a holiday home is that it is a less expensive option, especially for groups. This way you can enjoy more luxury for less money. In a holiday villa you will have plenty of room, so you can easily store all your beach items without them being in the way. There are holiday villas available in all shapes and sizes, so you can pick one that really matches the wishes and needs of your entire travel group. Go for a swimming pool, a lovely terrace or indeed a large balcony. Choose a holiday home with the perfect location and facilities for everyone. In a holiday home you can really feel at home, after all you have your own place here with all the comforts from home: plenty of room, privacy, a lovely sofa, a great kitchen and a large dining table. Holiday homes are also ideal for groups: so after a day at the beach you can enjoy some quality time here with your friends or family in peace. Take a refreshing dip in the pool, switch on the barbeque and have a lovely meal together or enjoy a nice glass of wine and a cool breeze on your private terrace with a sea view during a sultry summer evening. Plan your holiday the way you like it. After all, in your own private holiday villa you are not subject to tour schedules, strict meal times or the times that the swimming pool is open. A holiday villa near the beach and for an affordable price, fancy that? Would you like to receive more information about renting a holiday villa for this perfect beach holiday? Please do not hesitate to contact us, as true Spain experts we are happy to help you!